lot has changed for CHVRCHES in the past few years. When the Glaswegian trio wrote and recorded their debut, The Bones Of What You Believe (2013), no one had heard of them. 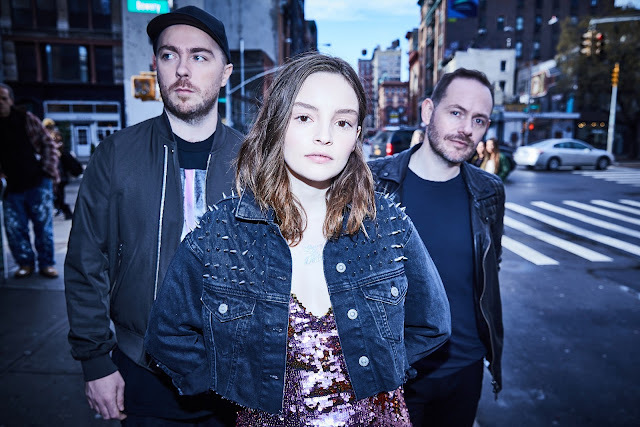 The three members (Iain Cook, Martin Doherty and Lauren Mayberry) came together with the idea of working on a writing project together, unsure of what path that would take other than one which belied their previous musical projects and foregrounded melody and classic songwriting styles before everything else. There were no pre-existing ideas of what the record would or should be like, no pre-conceptions and nothing to live up to  just three people in a basement studio in Glasgow making music they believed in. The Bones of What You Believe went on to sell over 500,000 albums worldwide. The band enjoyed critical success, with accoladed coming from Pitchfork, Spin, Rolling Stone, Q, NME and many more. They made their debut US TV performance on The Late Show with Jimmy Fallon, and then went on Jimmy Kimmel Live, The Late Show with Letterman and Last Call with Carson Daly. Theyve clocked in 364 shows in 2 years, selling out venues across the world and making signature appearances at Coachella, Bonnaroo, Sasquatch, Lollapalooza, Australasias Laneway Festival, Reading & Leeds, Summer Sonic in Japan and myriad others before retiring back into the studio for another go. Made in CHVRCHES Alucard Studios  a converted three-bedroom flat on the southside of Glasgow  Every Open Eye offers an alternative approach in a climate of music written by committee or the same handful of well-known songwriters, going back to the idea that a band can write, record and produce their work entirely by themselves. Musically, Every Open Eye seeks to do more with less. To make big sounds without racking up endless tracks within Cubase sessions. To make something intense and urgent and visceral, using the basic tools of melody, rhythm and arrangement rather than the mentality that more is more. Sonically, Every Open Eye develops CHVRCHES signature style, juxtaposing the light and the dark, creating their own brand of twisted pop music that uniquely merges the organic with the electronic, molding sounds and ideas forged over two years on the road into an electronic-pop record with a heart. Lyrically, Every Open Eye is not a break up album. It is a record about past heartbreaks and getting over them (Leave A Trace). About perspective and the benefit of hindsight. About being unapologetic and not being told what to do or who to be (Bury It, Never Ending Circles, Playing Dead). About moving on to better things, holding on to the good and letting go of the bad (Down Side Of Me, Clearest Blue, Afterglow).